For a limited time, you can get this bundle for $24! That’s 93% off! The bundle not only has festive fonts, it has cutting files for your Cricut or Silhouette machine. The bundle includes 10 Christmas fonts, Christmas Monogram frames, hundreds of Christmas cut files, quotes and more. At its current sale price, it’s pretty much a no brainer. 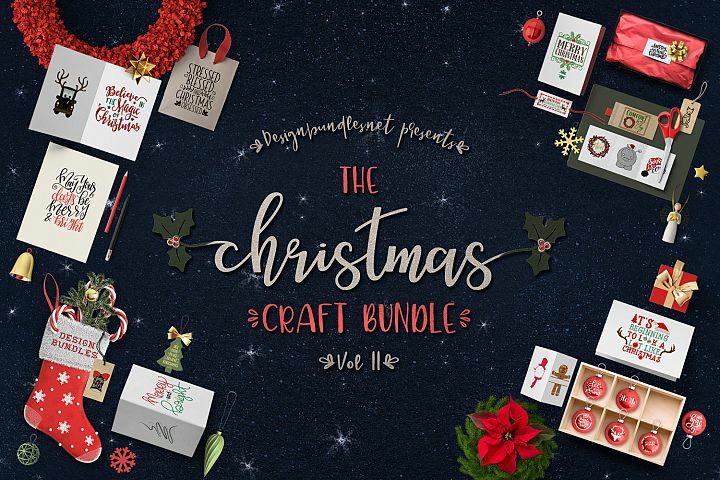 This bundle is a must have for any Christmas Crafter. If you’ve been around the Rock This Revival community for any amount of time, you are well aware that I’m not much of a cook-er or a baker. That said, I can slice pre-made cookie dough like a boss. This year Madelyn, Maryl, Annabelle, Ellie, Emily, and my mom are all getting Christmas aprons. Having fun aprons to don while we’re in the kitchen, makes Christmas more special. It’s all about memory-making! Who knew you could create framed art people actually love for under ten dollars?! All you need to complete this project is a printer, cardstock paper, and a frame. My mom is absolutely getting this framed print at Thanksgiving to have for the Christmas season. Have co-workers or teacher gifts to buy? This is a great option. I love everything about this file… the message, the colors, the fonts, and the design. With a quick upload to Cricut design space, I can create a shirt in about 30 minutes from start to finish. My youngest nieces, Annabelle and Ellie, are getting these shirts to wear to their school Christmas party. As you can see, the Christmas Design Bundle will pay for itself! It will also give me hours of enjoyment as I play around with everything in it. So… what are you making? Let me know in the comments!